» Has the world gone topsy-turvy? Today represented another big WIN for responsible scientific journalism in Australia. First there was Rebecca Letourneau’s accurate report on the dangers of not vaccinating on Channel 7s Sunday night programme. You can hear my interviews with her on The Skeptic Zone episode 28 and 29. Thank you to the ABC for listening, considering what we said and making changes for the benefit of the community. Also, thank you to Fuzztwin for alerting me to this and to all who commented, especially David McCaffery. “..Well done sceptics! Keep working hard to save and protect our babies and community”. 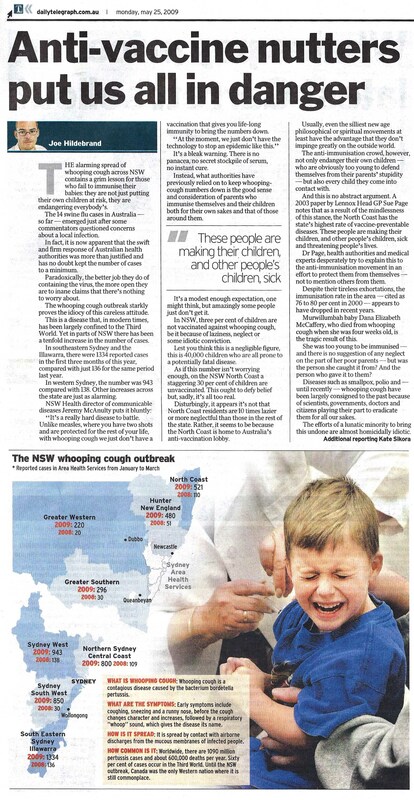 Following on from an equally damning article by Adele Horin from the Sydney Morning Herald in January 2009, the Sydney tabloid newspaper, the Daily telegraph published an article written by Joe Hildebrand about the irresponsible anti-vax movement today. It has not been a good day for the anti-vax movement in this country. To add insult to injury, the Stop the AVN Facebook page reached over 500 members today, and this has occurred shortly after the AVN Facebook Fan page (can’t show you the link, because I quite simply can’t find it!) has seemingly disappeared off the face of the earth. Fear not readers, we have many other irons in the fire, which I hope to reveal to you very soon. In the meantime, keep up the fight by signing the Stop the AVN petition and leaving a message of support at Dana McCaffery’s Facebook page. Also, don’t forget my report from Dr Rachie that started my campaign against this group of scaremongers. 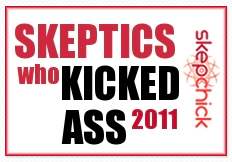 Or listen to the audio from Episode 19 of The Skeptic Zone. The world really has gone topsy-turvy and I couldn’t be any happier!